"Does anyone in the house smoke?" "Are you a stay at home mom?" "Do you have any family support in the area?" 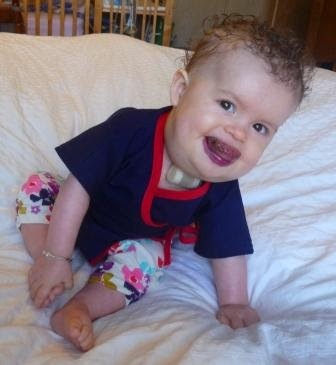 "Well, you were meant to be a trach mom." I wasn't so sure about that, but I was willing to humor her. On day four it was brought to my attend that some adjustments would need to be made in her wardrobe. It is suggested that trach kids wear V-neck tops to allow for airflow around the trach and decrease the likelihood of trach occlusion. Well, it just so happens I sew. On day five I was trained to give CPR with a trach and how to rescue breath via ambu bag. Though practicing on my own child was horrifying I found that my glory days as a lifeguard came back to aid me. At this point I was starting to believe I was meant for this. I scour the local consignment shops for V-neck baby attire. Sometimes I hit big and sometimes I walkout empty handed, but that's okay, because I sew. When Katie contacted me about sharing our story on film I had no idea what I would wear, but there was no question that Maaike would be wearing something I made. 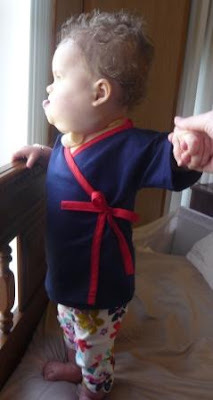 One of my favorite patterns for Miss Maaike is this kimono pattern by Amy at Habitual. It's easy, it's quick, and it's oh so cute. I like to make it out of a knit material because it's softer and instead of having the inside tie together with a bow, like the outside, I like to use a simple snap to reduce the bulk a little. It's the perfect pattern for a last minute baby shower gift or a trach baby just home from the hospital gift. The first one I made took about an hour, but now I can whip one out in about 20 minutes. They are great for pairing with bright leggings, like Maaike's from Target. Miss Maaike is 10 months old today! I can't believe how fast she is growing! 10 months down and 2 to go until we party hardy! 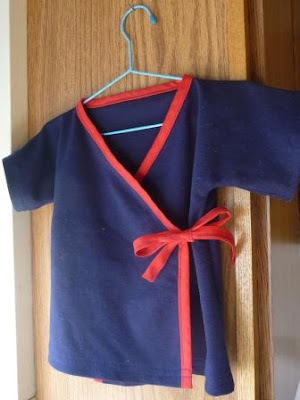 What special needs sewing projects have you done? I'd love to share them with our reads. Love her little top and curly hair! when my older son was 18 months old, doctors suspected that he had an epidural abscess and he had a pic line and an medicine pump that he had to wear for 24 hours a day about 6 weeks. The hospital had a fanny pack set up that just would not have worked for my 18 month old. I ended up sewing a modified quilted back pack to hold his medicine pack and pump that he wore. Thank you so much for sharing your challenges and joys of raising Maaike. You are amazing woman and an amazing mother. She looks so happy in the pictures you post. I look forward to seeing her 1 year blow out celebration. maaike is beautiful and happy--it's so obvious. good job momma. What a gorgeous girls she's turning out to be! I have just finished some sewing for my new nephew who was born 8 weeks early. Basic kimono type nightie but smaller than any pattern I've been able to find online and no store bought clothes were suitable (for monitors etc) or else they were too big! His parents also appreciate being able to leave him wearing clothes made with love exclusively for him! !